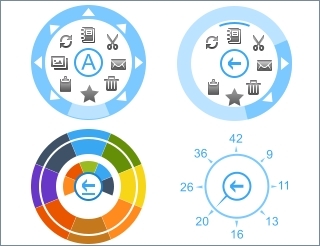 Touch-centric radial menu will make complex hierarchical menus be compact and intuitive. It provides smooth gesture-based navigation and interaction with application elements. It is usually used as a context menu and leaves more free space for the application content. 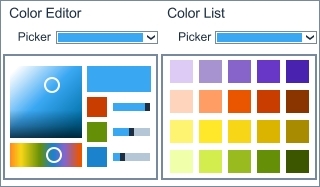 Perpetuum Color Picker adds the ability to change color of the application components. Pick color from the list or set color tone in the color editor. Selecting colors is touch oriented and habitual at the same time. In addition to the standard text input, Text box adds the ability to insert specific items such as buttons inside the text box. The control can validate entered characters and allow only letters or only digits or both. It’s possible to add any similar validation. Common flat menu control composed in a more compact way. All nested menus are not thrown apart of main menu, they appear instead, thus leaving more free space for the application content. Getting back to the previous menu is just a single click. The component allows quick and convenient selecting of time intervals with the help of two elements for setting hours and minutes. Current time is set with a single click. The component allows quick and convenient selecting of date using the drop-down calendar control. Date format can be changed to address your preferences of how the date elements should be arranged (day/month/year). Windows 8 rating control adds the ability to rate some content in your application or application itself, this is the easiest way to get feedback from your customers. 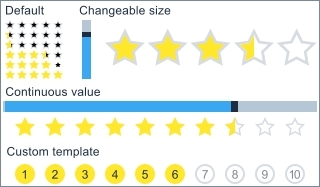 Size of the rating stars can be adjusted or they can be changed to user-defined elements (diamonds, smilies, etc.) to smoothly fit into your application interface. Numeric box adds the ability increase or decrease numeric value with a predefined step within a pre-defined range using special buttons. It’s very useful when users are to input some sensitive data. Add advanced flyout menus to the target application element. The control is customizable: you can set margins, add user-defined UI element to the popup, precisely position it on the left or right, top or bottom or at any other application area. Expander control provides a way to provide content to the users in an expandable area that resembles a window and includes a header. An accordion control adds the ability to organize the content into expandable panels. When clicked, the panel makes the content visible while the other panels are hidden. It’s possible to add virtually any content to the panes. Breadcrumb control is a part of the navigation that makes it easy to navigate the content. It’s very convenient for the content with extremely complicated and nested structure, since you get at a glance idea of how many items are inside the definite menu item and can always get back to the previous menu level. Tab control offers the ability to define multiple pages for the same area of the application. Tabs usually group information or controls based on their type. Tree View control adds hierarchical view of the information structured as tree with nodes. It is especially useful to show document headings, files and directories or any other hierarchic structures. The control supports HierarchicalDataTemplate that allows the creation of templates for hierarchical structures. Layout Transformer helps developers easily manage application content and controls: buttons, text boxes, numeric boxes, etc. It automatically layouts elements when some modifications are done, for example, an element is rotated.